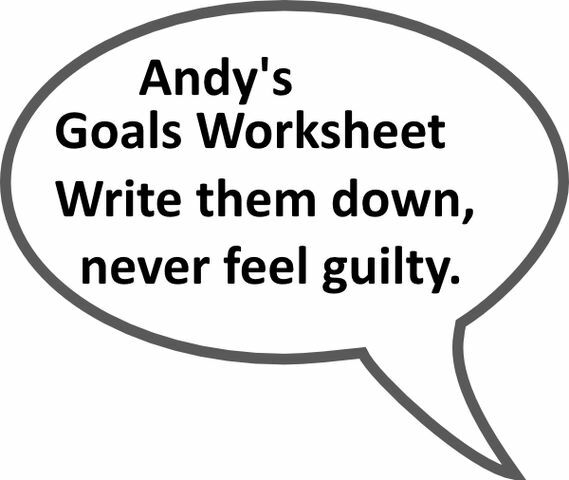 Happiness is evasive here is my personal goal worksheet, so you can see an example. By writing them down, they sit in the back of our mind working. Write them down, never feel guilty,share with friends, and good friend will kindly remind you when you stray..
4. Avoid the religious zealots, so as to avoid judgment or resentments. 5. Look for new friends, and girls daily for talking. 6. Find new hangouts in city where I am located. 1. Don't do, or say anything that makes me appear weak. 2. Erase anyone who tries to lower my social status. 3. Good profiles, good photos. 2. Read one book per week. 3. Do NOT use Smartphone. 5. Write 1-3 blog posts per week. 1. Give 3 strikes and you are out to potential friends, then erase from life. 3. Say no more to bad request, and say yes more to good ones. 4. Spend less than 10 minutes per day watching world news. 6. Make a list of 3 things daily to be grateful. 1. Go for walk daily. 3. Tie shoes standing up. 4. 100 squats with chair. 5. 100 bicep curls with one gallon bottles. 1. Have an person handle every aspect of my taxes, from bookkeeping to filing. 2. Double Amazon Sales yearly. 5. Ship 1 load of Teak from Togo to USA every 2-3 months. 8. 5 locations on planet with room rental of 25-35 per month. 1. Stop and see Mom two times per year. 2. Stop at home of all family members one time per year. 3. Listen to family members, and keep opinions minimal. 4. Find a wife, or mate. 4. Do not give suggestions, allow people to ask. 5. Keep my mouth shut. Can I just say NO to this 15 Minutes Of Fame Thing?